Looking at corporate results for the second quarter, it seems that business confidence is increasing. However, the same has not yet been reflected in investment demand. Ever since the NDA government came to power, investor sentiments have improved. In this light, corporate results for the second quarter of 2014-15 were being watched closely by all the interested parties. 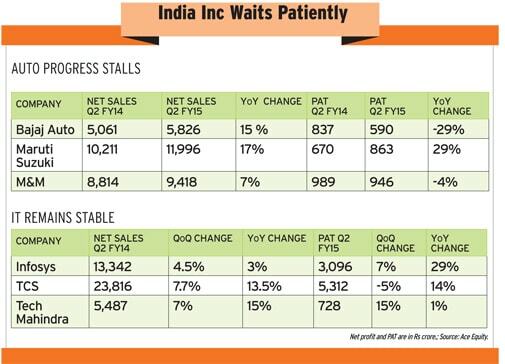 However, it seems that while investor confidence has risen, India Inc is still taking cautious steps. According to Dhananjay Sinha, head of research and strategist at Emkay Global, aggregate sales for Sensex, Nifty and BSE 500 companies has seen marked deceleration. Compared to the previous quarter of this fiscal year, aggregate sales growth for the Sensex came down from 17.1% to 2.3%. Similarly, sales growth for the Nifty fell from 16.3% to 3.8% while that for the BSE 500 decelerated from 13.4% to 6% (excluding oil and gas and banking sectors) during the same period. "The combination of fading effect of rupee depreciation which aided performance of companies in the past four quarters, tighter fiscal measures and normalisation of spending after elections have impacted corporate performance this quarter," he said. According to Nilesh Shetty, associate fund manager, equity, Quantum AMC, automobile companies have done well owing to the low base on which they were reporting numbers. While net sales for Bajaj Auto grew 15% on a year-on-year (YoY) basis, EBITDA margin grew 110 basis points (bps) on a quarter-over-quarter (QoQ) basis to 20%. Maruti Suzuki saw sales grow 17% YoY and profit after tax (PAT) rise 29% YoY to Rs 863 crore. The company is seeing volumes recover in urban markets after a prolonged slowdown. On the other hand, Mahindra & Mahindra's performance was below expectation due to subdued volumes and increase in costs. FMCG witnessed mixed numbers, hurt mainly by a slowdown in demand. ITC saw revenue grow 15% YoY and PAT by 9%. Marico's sales grew 28% YoY, beating estimates, but a 12% YoY rise in PAT fell short of estimates. HUL saw sales rise 10% and PAT grow 8% on a YoY basis, below estimates. The growth of these companies depends upon how well the market grows and how the demand rises, which may happen after the fourth quarter of 2014-15. Cement companies had a good quarter. UltraTech's second quarter EBITDA (operating profit) rose 28% YoY to Rs 930 crore, while realisations rose 5%. Similarly ACC saw net sales, EBITDA and PAT rise 10%, 32% and 62%, respectively, on a YoY basis to Rs 282 crore, Rs 38 crore and Rs 190 crore, respectively. The low base of last year and improved demand are likely to result in strong growth over the subsequent quarters. But the cheer for the cement industry hasn't spread to allied sectors, namely capital goods and infrastructure companies. Mayuresh Joshi, VP, institution, Angel Broking, explains: "The results of capital goods/infrastructure companies have disappointed as people were expecting substantial order flows. However, the sector is not getting enough orders." L&T reported consolidate order growth of 17% YoY, but overseas order book remained muted. BHEL reported weak performance with revenue falling 32% YoY and adjusted PAT down 73% YoY owing to weak order flows. For the last several quarters, export-oriented sectors like IT and pharma have done well due to currency depreciation. Although the rupee has gained in the recent times, even now dollar revenues for these sectors like IT and pharma are healthy on a constant currency basis. However, on rupee-denominated basis, this is not the case. Sinha of Emkay Global feels this will be the case over the next three to four quarters. India's largest software company, TCS saw slow volume growth, while Infosys has shown some traction. Within the pharma sector, too, expectations were high since it had done well even in bad times. It did not disappoint. Divi's Lab saw revenue rise 47% YoY and EBIDTA margin by 36% during the period. Lupin's PAT grew 53% YoY, but sales growth of 18% YoY was below estimates. 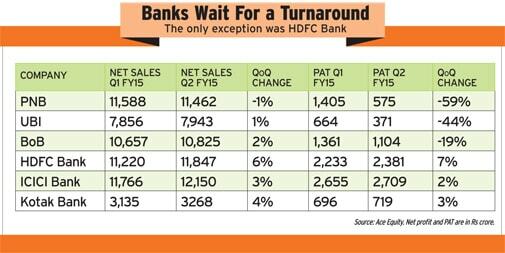 Banking stocks have fared well to an extent since NPA rates have fallen over the year. However, stressed assets of PSU banks still remain high. Punjab National Bank's PAT of Rs 575 crore was significantly below estimates as higher fresh impairments during the quarter not only pushed net interest margins (NIMs) down by 24 bps on a QoQ basis but also resulted in higher provisions, says a report by Emkay Global. According to a report by Motilal Oswal, HDFC Bank is best-placed in the current environment, with a current account savings account (CASA) ratio of about 43%, strong earnings growth and least asset quality risk. According to Rajiv Bajaj, VC & MD, Bajaj Capital, expected earnings growth is a critical component of any futuristic valuation exercise; the valuations can look cheap or expensive depending on your growth estimate. In order to sustain the current valuations, we may need support from earnings growth. Further, going forward the GDP growth rate is likely to pick up, which could translate into better numbers for corporate India. GDP growth for the first quarter of this fiscal has recovered to 5.7% as compared to sub-5% readings a year back or even a quarter back. Consumer and business confidence are increasing. However, the same has not yet been reflected in investment demand (capex). According to Bajaj, what matters now is the pace of the recovery. "With the right steps, the pace should be robust and in the next year, we may see GDP growth touch 6%," he adds. According to Sinha, the rate of inflation also must sustain at a low level for longer period only then productivity can be generated. Shetty of Quantum says the market is currently factoring in 8% GDP growth, which is stretched hence there is room for a 15% to 20% correction he adds (his funds are holding 30% cash), before we move in again.